A resonant device that converts high frequency electrical energy into high frequency mechanical vibration. The material that performs the conversion is either piezoelectric or magnetostrictive. 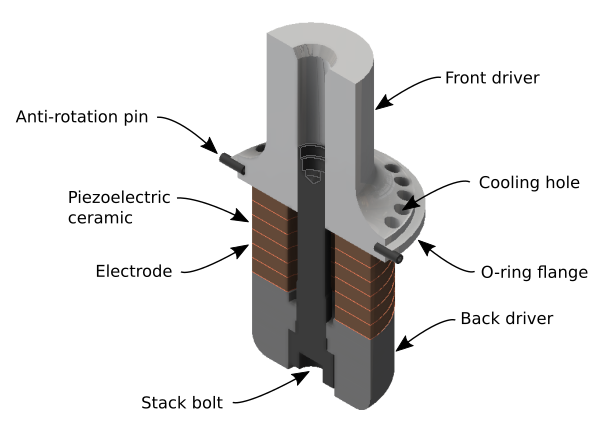 In many cases the transducer is mated to other stack components. In that case, the the other stack components should have the same nominal resonant frequency as the transducer. In some cases the transducer is a stand-alone unit (without attached resonators) that delivers energy directly to the load via the front driver. For instance, this design might be suitable for a handheld therapeutic device or an industrial device where the overall length must be minimized.